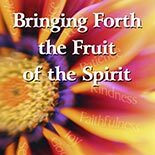 The fruit of the Spirit doesn't often come by God zapping the Christian. More common is that God uses His discipline to show us how glorious HE is and how pathetic a life of self-indulgence is. If we are born a second time, we have the fullness of the Godhead within us, so we have everything we need to destroy sin and express His fullness. We are only limited by our level of trust, belief, and obedience. Is He More Precious Than…? YES! Response to "Results of the Second Birth and Being Abandoned to God"